I’d like to start out by thanking all of you who have pinned us on Pinterest! 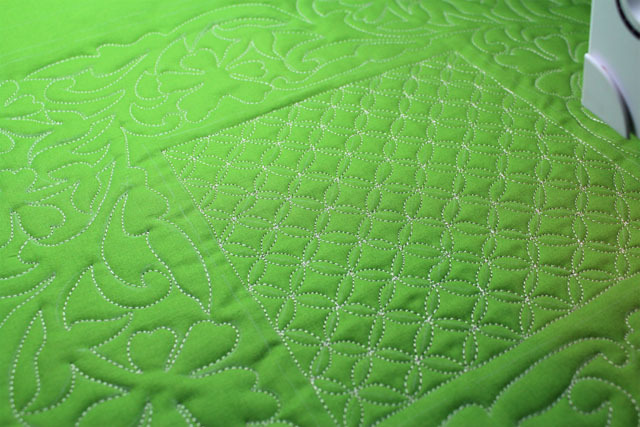 We have many many new free motion quilters, doodlers, and quilt lovers who will be joining us thanks to your efforts—so KEEP PINNING! Welcome to all of you who found us from Pinterest! 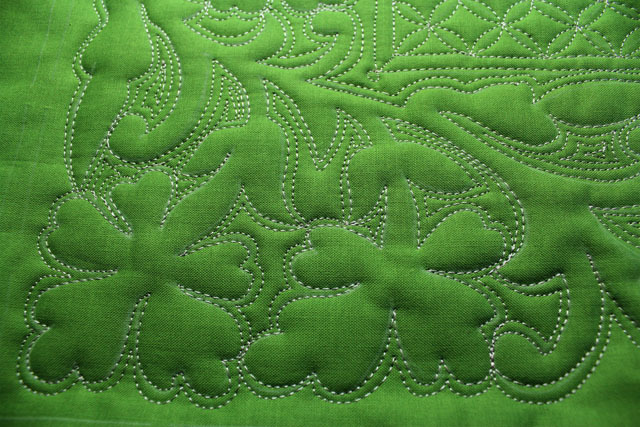 I’d also like to offer a big thank you to those who have left comments along the way and the quilters who entered the drawing for the fabulous Geranium Stencil from The Stencil Company. Your comments help me plan tutorials, posts etc. –so KEEP COMMENTING! 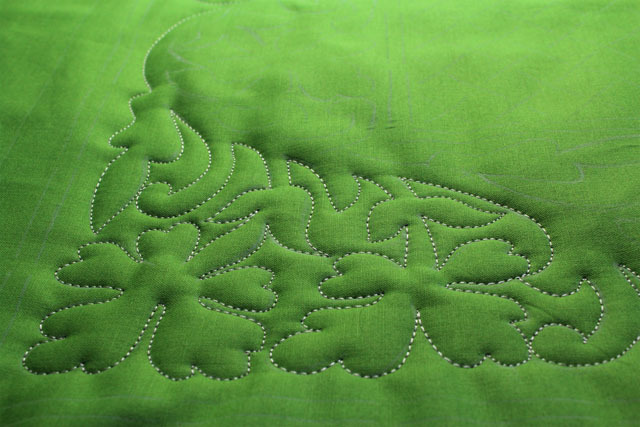 As you may recall (read more here), I chose this Geranium stencil –reminiscent of a four leaf clover–and green fabric to make a new quilt for St. Patrick’s Day. I really like this stencil because it is so versatile. 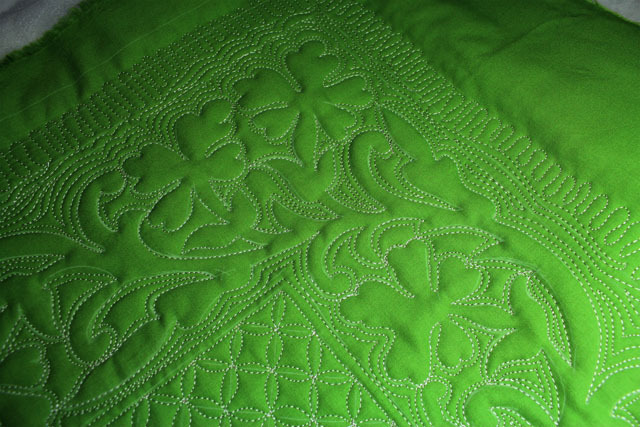 The pretty leaf design will look like geraniums when stitched on pink/coral/rose fabric, but it doubles nicely as a four leaf clover when stitched onto green fabric. 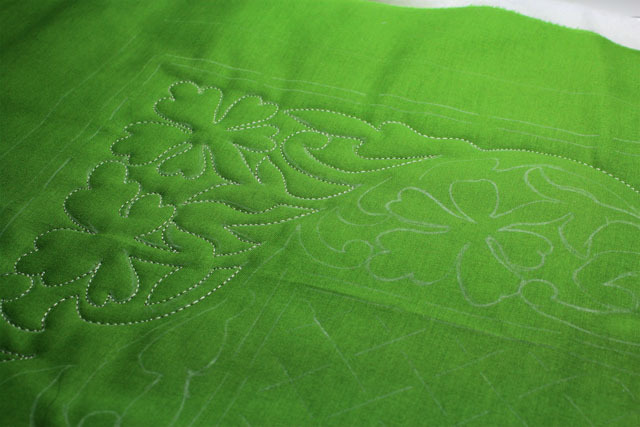 Now, without further ado…the two winners of The Geranium (Shamrock) stencil are: Rhonda and Judy @grandparentsplus2. Congratulations! Woo hoo! Please contact me (see my About page for my e-mail address…and I will get those stencils to you! 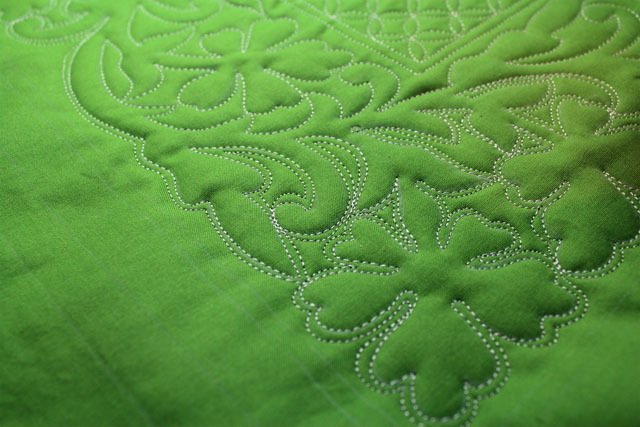 I will be offering chances to win a Shamrock Doodle Quilt in March! 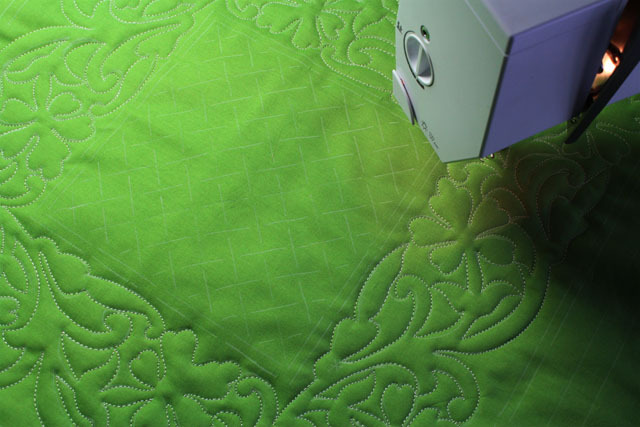 More tutorials, more giveaways, more fun…and more Quilt Appreciation 1o1 coming every day! You don’t give yourself enough credit! I want to see a finished pair of baby booties before his first birthday! LOL! Congratulations to the two winners! This is a very pretty stencil design. 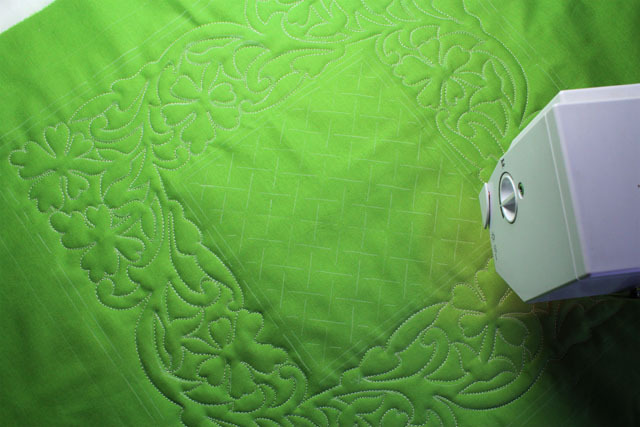 I do have a question – how do you fit larger quilts on your machine to doodle quilt? Or do you only do small ones? That’s my biggest problem. Oh, good. 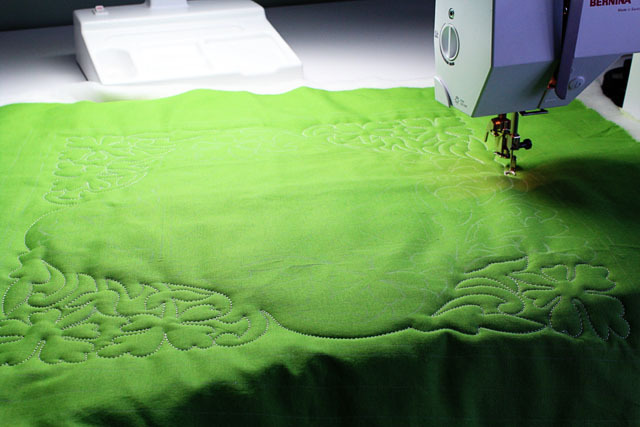 😀 I was going to ask how you did the center, if there’s a pathway to follow for continuous stitching. Is that what they call sashiko? 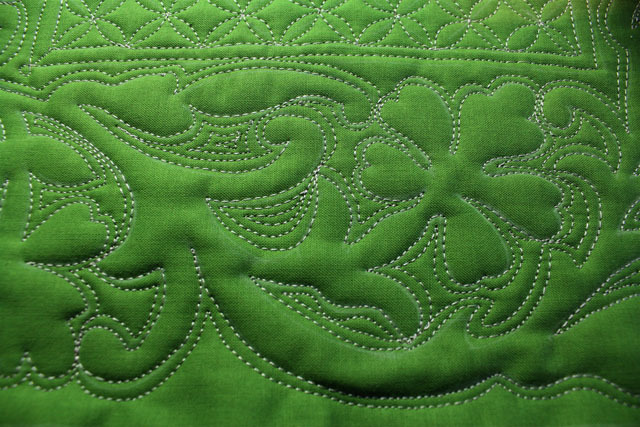 Love the details and the way your stitching makes those motifs pop. Can’t wait for the cross hatch tutorial. Thanks for sharing!